Contrary to accepted belief, developing and enhancing cognitive ability can be achieved at any stage in life. 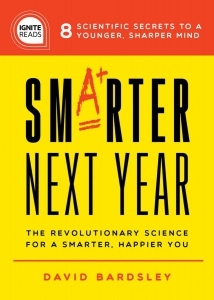 Smarter Next Year presents the latest scientific information and best practices for increasing intelligence at any age, whether you're 25, 55, or 105. This self-help book provides the tools to take your mind into your own hands and stave off the effects of time. Contrary to popular belief, genes don't control your brain - you do. Train your brain with proven techniques to improve cognitive ability at any age.